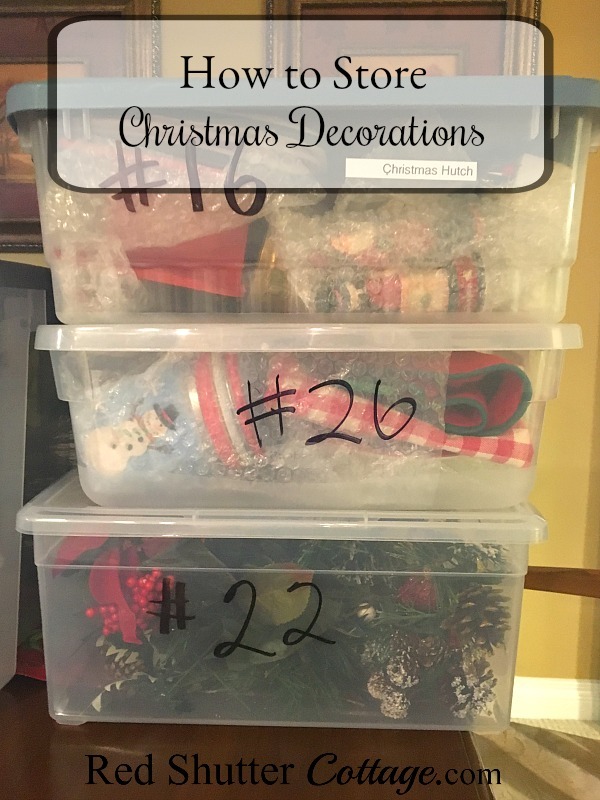 It will help you easily store decorations, easily find specific decorations or bins you are searching for, and easily re-pack bins quickly and efficiently. Step 2: When you are collecting bins, keep in mind the size and dimensions of your storage area. You may want bins all the same size, or a good mix of sizes that can be stacked or arranged to fit into your storage area. Along those lines, think twice before deciding on the huge 4’ x 3’ bins. Tempting as they are, because they can hold so much stuff, keep in mind they are bulky, often heavy (full of stuff), and can be hard to lift, carry, or even store. Step #3: Use a 3-ring binder (either full size or half size – your choice). Purchase index cards, tab dividers, a King Size black sharpie, and you will need a paper punch of some kind. Step #4: The following are the steps to put your whole storage system together! 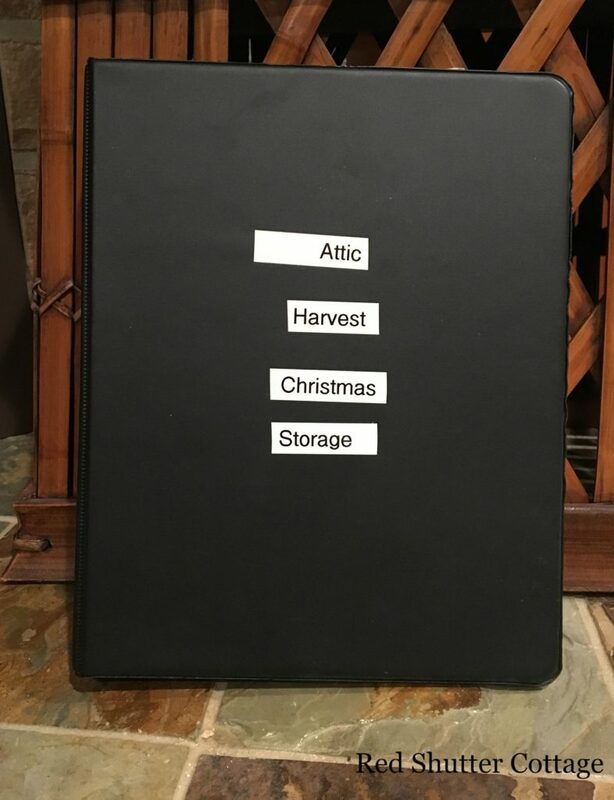 A: Begin by creating your storage binder. This is your system–so create tabs as needed. Perhaps you only decorate for Christmas. Or, perhaps, like me, you are a little obsessed with seasonal decorating, and you decorate for 4 or 5 seasons/holidays. 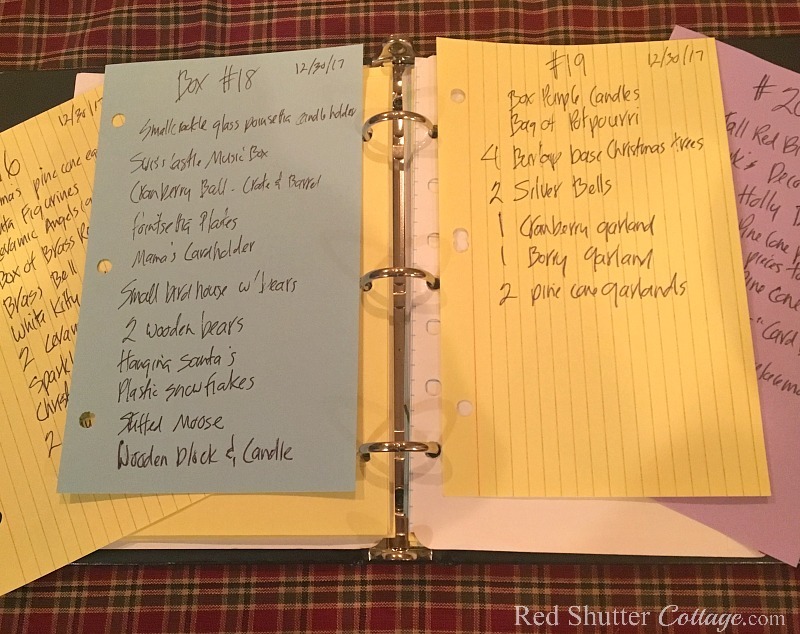 Regardless, create a tab for each season, or if you prefer, create tabs for categories: Fall garlands, Christmas snowmen, Thanksgiving table decorations. Or maybe you like to organize decorations according to rooms: dining room, living room, guest bathroom. Whatever works best for you is the best system to create! B: Punch 3-ring holes into your index card pages. 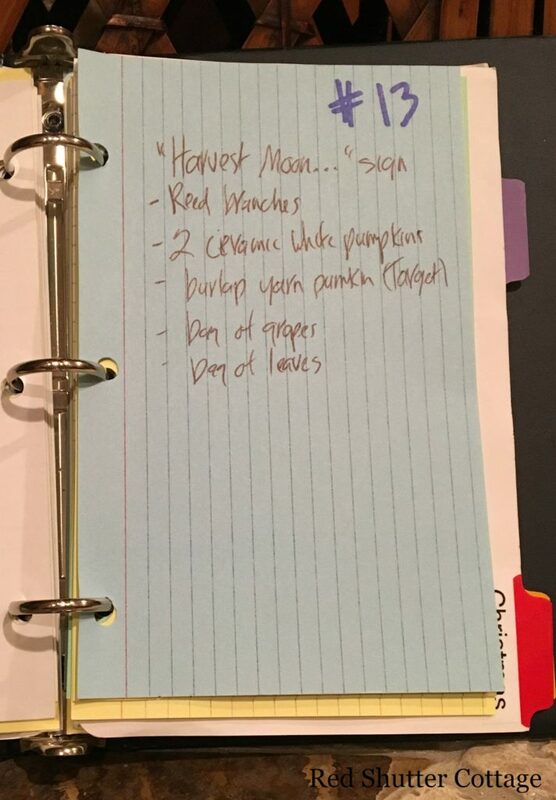 Each page will contain a list of the contents in a specific bin. 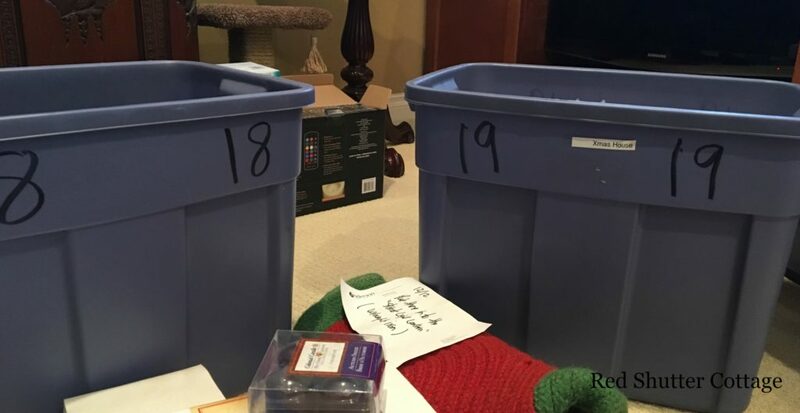 C: Using your King Size black sharpie, write a number on each of your bins. Make the numbers nice and big (4” – 5” high), and write them on all 4 sides, closer to the top for easy identification. D: Now, put it all together. Open up bin #1. Take one of your 3-hole punched pages and write #1 at the top. (I also find it helpful to date my pages; I will explain why further in this post.) As you put the items in the bin, write them on your bin #1 page. When that bin is filled, move on to bin #2, using the same process. I know I said this would be easy, and in reviewing what I have written, it seems like a lot of work! But honestly, this is the ONLY part that is work. And you only have to do this once; even the maintenance is easy with this system! The beauty of this system is flexibility. This is important because bin contents can change over time. 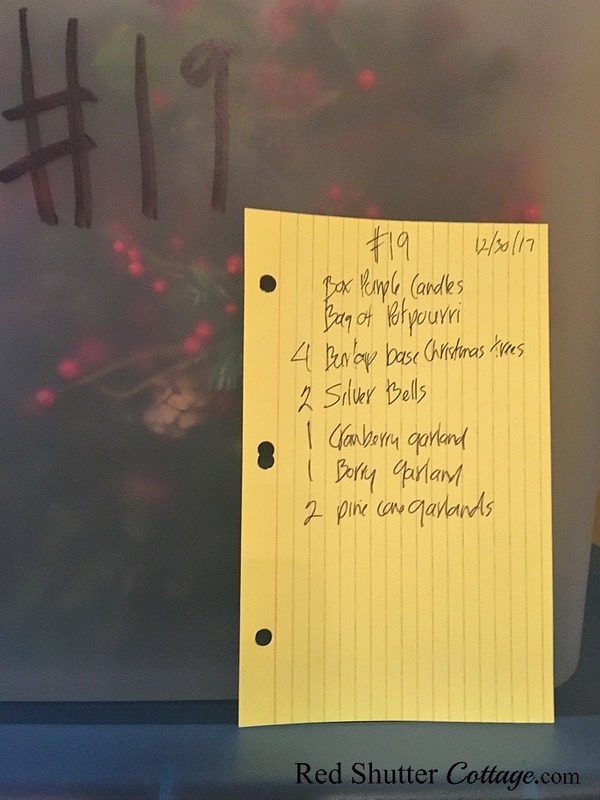 For example, when I was decorating for Christmas, I came across a little red tin bucket with snowflakes in bin #18. 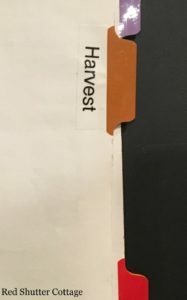 I realized I haven’t put it out for display for a couple of years, so I placed it in the donation box, and crossed it off the list for bin #18. In the meantime, I had just purchased a new Christmas runner that needed a home. So I added the Christmas runner to the page for bin #18. When this sort of activity gets to a point where the page for bin #18 can barely be read, it’s simply time to re-write it. The page for bin #18 gets revised, out comes the old page and in goes the new page. I try to include the date on the new page as well, so I know when I last revised a bin. I have a small, black 3-ring binder, and use 8 ½” x 5 ½” cards with 3 holes punched. I have 3 tabs: Fall, Christmas, Misc. This is all very simple and basic; I don’t have any fancy colors or stickers. Everything is handwritten, but not always legible! Regardless, the bottom line is I am in charge of the bins! They don’t tell me what to do, I tell them what to do! Sailor likes it because I no longer say “Can you please pull down the bin with all the kitchen hutch decorations?” (This is a surefire way to really aggravate him!) Now I can just say to him: “Can you please pull down bins #6, #7 and #9?”. 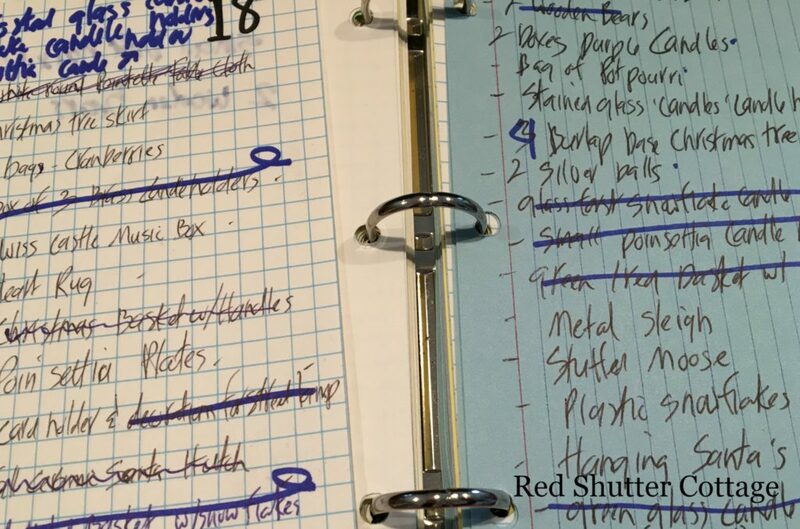 To recap, you need a 3-ring binder; large or small – whichever you prefer. 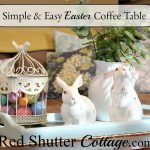 You need tabs for each season, each room, each category, depending on how you decorate. You need pages that are 3-hole punched; I prefer index cards because they stand up to being removed and replaced into the binder. You also need your bins, and a big fat black marker to write the numbers on them. Then just start filling your bins and recording the contents. And enjoy the power you have over your bins! There is such a feeling of accomplishment and satisfaction when your decoration bins are well-organized — and the peace of mind that comes with knowing you can find anything, quickly and easily! Hi Kristine, what a great storage system, love how you can keep everything indexed so easy. And to use index cards in a 3 ring binder is brilliant! Thank you Marjan! This system has been such a huge help, and the flexibility is big a bonus. If you have any questions about it at all please let me know! Hi Kristine: I am pinning this. 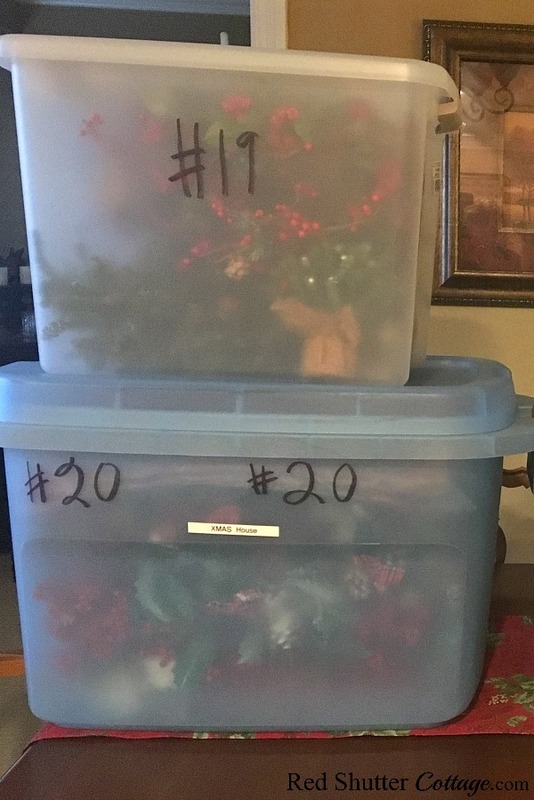 I have large rubbermaid totes that I use for Christmas ornaments. I tag each one according to colour but don’t do a binder like this. This is a great system. I appreciate you sharing. Thank you Leanna! Having the pages in the binder is like turning all the totes in clear plastic. Instantly knowing what is inside of each tub is a huge stress reliever!